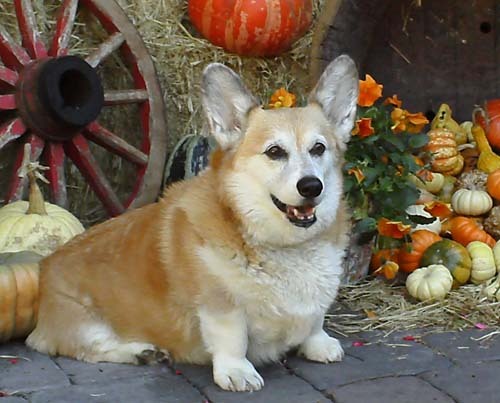 This tribute to Caleb the Corgi was so moving that we wanted to share it with all of you. It is a great reminder to spend every minute we can enjoying life and laughing with our pets who are such great teachers. Thanks to J, J, and K for sharing Caleb with us. Our sweet dog Caleb lost his battle with cancer on August 12. He lived eighteen months after his lung surgery, longer than the statistical average, and he had some good adventures in that time. He didn’t suffer too much, just was more and more labored with breathing until it was obvious not to go further. He was 13-1/2. Caleb’s last day was good: a walk in Sibley Park with Karen, his beloved god mother; a walk and ball chase with me on Pete’s lawn next door, his favorite place to end his daily walk; and hanging out on the back deck gazing at the yard, which he loved to do. His decline that night happened very fast, for which we are grateful. The amazing team at Bay Area Vet Specialists kept him comfortable until the end. We went to the Yuba River this week, a place he adored. We would hike in about a mile, front herded and back herded by Caleb the Corgi. And when we reached our destination, a beautiful emerald pool surrounded by small waterfalls and huge boulders, Caleb would race down to the water, ease in slowly on his short little Corgi legs, and swim and play for hours. His spirit is everywhere there and Hoyt’s Beach is now renamed Caleb Beach. We are moved to tears by the love given to Caleb by his vets. In addition to excellent loving care, a flood of memories have arrived. Right after he died a lovely ivy plant arrived from his regular vet. Yesterday, I picked up his ashes and was amazed by the gorgeous wooden box containing an ebony plaque with his name. Today a book called “Dog Heaven” arrived signed by all the Bay Area Vet Specialists and staff, a sweet illustrated story with Caleb’s photo inside (not sure how they did that!). And we are grateful to you for the years of love, fun, and support you have given to Caleb, either in person or by your good wishes. As you know he was very social and adored your company. He always barked along to “Happy Birthday” with such glee. You pet owners know that they are in our hearts forever.